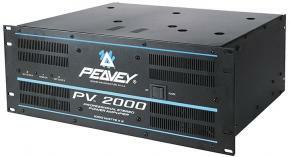 The Peavey IPR 1600 stereo power amp features 830 watts per channel at 2 ohms and weighs in at 7 pounds! The IPR1600 also has 2 channel independent fourth order Linkwitz-Riley crossovers, a variable-speed fan housed in a lightweight aluminum chassis, patented DDT speaker protection, and the revolutionary new IPR class D topology. Boasting a net weight as low as 7 lbs., the groundbreaking Peavey IPR Series of pro audio power amps utilize an advanced design that allows Peavey engineers to dramatically reduce weight while increasing output power, reliability and thermal efficiency. IPR Series amplifiers are designed with a resonant switch-mode power supply and a high-speed class D topology that yields the highest audio resolution and efficiency available. And all at a cost that shatters the old-guard paradigm of power-amp valuation. The IPR DSP Series amplifiers feature the same power ratings, design and efficiency, plus a 32-bit processor with a suite of delays and crossovers, pre-programmed loudspeaker settings, stereo/mono operation, lockout—and for the first time in any power amplifier, built-in Waves MaxxBass technology, which uses psycho-acoustics to add more low-end to your system without the need for more power amps, processing or subwoofers. Amps in the IPR DSP line contain presets for Peavey SP, PR, Impulse, SSE, QW, PV Series loudspeakers and monitors, as well as other commonly used loudspeaker configurations, plus special presets for program music applications (dance, speech, rock, thump, loudness, contemporary worship). Manual mode allows you to assign your custom crossover points, EQ, delay and more. I compared the IPR1600 amp to a QSC RMX2450 amp and I have to say that the QSC sounded 10x better. The IPR was very harsh in the mids and highs and almost unbearable to listen to. with the same set up and the RMX amp, the mids stayed smoother and there was much more detail. The IPR looks very cool and played very loud, it just dosn’t sound very good. Check it out for yourself. I have QSC PLX 2401, and 3001 power amps that power my Bose Panaray 802 III’s and MB4’s and they are super. 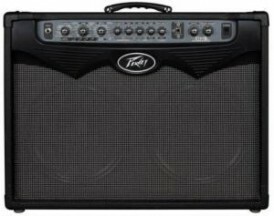 When I was first saw the new Peavey IPR1600, I was a little hesitant even, after hearing it demonstrated in the store, driving a set of JBL JRX12’s. What attracted me to this amp, is the seven pound weight. I thought my QSC’S were light at twenty-one pounds each. After using this amp to power up my Bose system, I gotta admit – for the price – it’s a lotta amp. The highs are a little more pronounced but with the Bose system I don’t notice any harshness, and the headroom seems great. Time will tell, but so far, for three hundred bucks, it’s hard to beat. Off the subject but, the new Peavey mixers are great also. I just replaced my Yamaha board with a Pv10 and the improvement is unbelievable. Hartley has done it again! Hi, thanks for the review. I’m sure it’ll be very helpful for other readers researching Peavey Power Amps. Bought this poweramp last week. weight and price seemed to good to be true. I do a solo act with backing tracks and play guitar and keyboard along with vocals. i use 2 SP2 cabinets and a peavey 20 channel mixer. the first night, i played a small club. it worked flawlessly and seemed to be perfect for my application. the next day i played an outdoor pool party gig. i had to play quite a bit louder and the amp kept cutting out. after 5 times of it dropping out, i took a break and disconnected it from my rack. luckily i brought my QSC power amp. i changed back to my QSC and had zero problems with it. guess this power amp was too good to be true. its going back to the music store monday for a full refund. I was skeptical at first, so before its first gig, I ran it hard through the paces and couldn’t make it quit. I bought a second one which was easy because of the price. During the past six weeks, both have been great amplifiers with sound so good you can’t help but notice. One drives a pair of JRX series subs and one JRX215. The other drives two monitors and a second JRX215. It is amazing how light weight the entire rack is now. I’ve noted that good reviews only get posted once, but the really bad reviews seem to show up in multiple locations and forums with similar names, dates and situations. It makes one wonder if there is an agenda. Read about this amp on the forums. My bass rig is an old Peavey Pro Bass 1000 preamp, Mesa Boogie 215 & Tech Bassline 212. I did use a CS200X bridged for the 212 and CS400 bridged for the 215. Now I use this wonderfully light weight IPR amp that sounds clean and punchy. I tried it on our main PA cabs and was surprised at how clear it sounded. As soon as the higher power model comes out, I’m retiring our Macrotechs. I’ve had the IPR 5 weeks and not had a bit of trouble with it. How can I connect an Ampeg B2-RE with the Peavey IPR-1600.